This intricately decorated illuminated manuscript known as the Schorn Book of Hours, written around 1430-1450, contains a collection of texts, prayers and psalms for Christian worship. Books of Hours are the most commonly extant form of late medieval illuminated manuscript. They were based on the Breviary of monastic and secular religious institutions but contained shorter and simpler offices intended for use by rich laymen. They were commonly kept as private prayer books, and their exquisite decoration was intended both as a display of piety and as a symbol of the wealth and status of their owner. 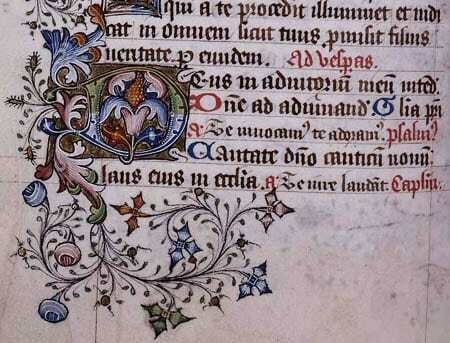 Many of the pages of the Schorn Book of Hours have full floral borders with small and large illuminated letters containing gold leaf preserved in excellent condition. Besides being an exceptional example of the artwork of late medieval illuminated manuscripts, the Schorn Book of Hours is an important document because of its relationship to Master John Schorn, the Rector of North Marston who became the object of a late medieval pilgrimage cult centred around the newly constructed St George’s Chapel in the late fifteenth and early sixteenth centuries. Following Schorn’s death in 1314, scores of pilgrims visited his burial place in North Marston, Buckinghamshire, in order to display piety, perform penance, and in the hope of gaining a cure or witnessing a miracle. Schorn gained a reputation as a healer of various ailments, including the ague (malaria), and rheumatic and eye afflictions. He was also believed to possess the power to resurrect dead cattle and the drowned. So substantial was the fame and profitability of Schorn’s pilgrimage centre at North Marston that the Dean of Windsor, Richard Beauchamp, decided to purchase Schorn’s bones and relocate them to St George’s Chapel. Beauchamp secured a licence for the translation of the bones in 1478 from Pope Sixtus. St George’s Chapel subsequently became one of the most important pilgrimage centres in southern England, particularly after 1484 when the body of the martyred King Henry VI was also translated to the Chapel. The relics of Master John Schorn were housed in a newly constructed chantry chapel in the south-east corner of St George’s Chapel. The St George’s Chapel Archives hold a bill dating from the late fifteenth century for the construction of a box that would stand by the shrine of John Schorn and collect the money given by pilgrims [SGC XI.D.28]. This iron money box, constructed by John Tresilian some time around 1480, can still be viewed in St George’s Chapel today. In 1480 the Chapter of Windsor appropriated the rectory of North Marston itself, presumably to control the pilgrimage cult and maximise its profit. The papal bull through which Pope Sixtus IV licensed the Chapter of Windsor to appropriate the rectory of North Marston is kept in the St George’s Chapel Archives [SGC PB.12]. It seems that the hymn was particularly intended to be sung by those on a pilgrimage. Schorn is praised in one verse: “Hail, leader of pilgrims, lead thou wayfarers to the joys above”. It is due to the existence of this flyleaf that it has been speculated that the book was owned by a pilgrim who had visited the shrine of John Schorn at St George’s Chapel in the fifteenth or early sixteenth century.